This Wednesday we will be Wandering into the mind of a keen observer. A brain that meticulously takes in information about people, about culture, about death. A sharp eye that contemplates, considers, and returns with judgement. A mouth that is not afraid to utter what the brain has concluded. The full package takes the form of an album that is brutally honest, and yet sarcastic. It is just as jubilant as it is morbid. The creators of this album have waited seven years to allow their work to see the sunshine, and it’s name is Free Candy. Yesterday, Edmonton’s The Wet Secrets started handing Free Candy out to all the children, and I’m sure I’m not the only one who will find this a bit…creepy. I don’t know how many times I listened to Free Candy before I really considered the title of the album, but when I finally sat down and thought about it I realized that there is no better way to describe the polarity of this record. Candy is amazing. Candy that you do not have to pay for is amazing. From the littlest children to the most decrepit old folks, everybody wants candy. At the same time, we are constantly warned not to take candy from a stranger, not to step into his van. We are all torn by the desire to acquire goodies that is being held at bay by common sense, but on one night we throw caution to the wind and get our grubby little fingers around every piece of candy in sight. Halloween. We celebrate black masses and the undead with individually wrapped bonbons. This is the nature of Free Candy. The music is upbeat, danceable, seductive. The lyrics are laced with unsettling imagery, scathing indictments of characters and social behaviour, and death all wrapped up in delightful pop melodies. And through it all, I can picture bass player and vocalist Lyle Bell looking on with a wry smile. Free Candy, beyond being an excellent example of direct lyrical and musical contrast, has a number of excellent qualities. The first thing I noticed were the keyboards. For a while I couldn’t quite put my finger on where I recognized those keys, but I knew their tone was unique enough to be comparable to only one much-loved band. The Doors. Those harsh organs with their bright punching quality fully reminds me of Ray Manzarek. Next was the vocals. I love the character dripping from Bell’s voice, and I love the harmonies that back his leads even more. There are amazing countermelodies in the backup vocals through the entire album. The bass work is crafty and right in the face of Free Candy. And oh my, the horns. It seems that any time a band throws a horn section into their music, the songs get taken up a full level. Add the horn section to the checklist of great elements of this record. Basically, what I am trying to communicate is that there is nothing on Free Candy that doesn’t add its own nuance to any given song. 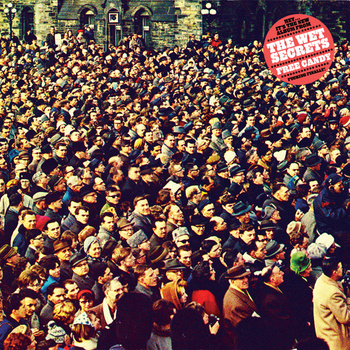 The Wet Secrets’ Free Candy is the first release of 2014 that has had me listening to it several times a day. I have so much more to say about this record, but I figure I will leave the rest to you listeners out there. The bar has been set rather high, let’s see how the rest of the world can respond to this monster album. It has been released as of yesterday (you can stream it free of charge), so get your chocolate stained fingers on some Free Candy as soon as you can. PS. Those videos…I think The Wet Secrets win lyric videos forever with cats and laser pointers. And Joe Flaherty murdering the guy from Twilight? I am satisfied.